The Morehouse basketball team practices at Forbes Arena on Saturday. This year’s Morehouse basketball team has a ton of recent history that they are neither trying to forget nor feel burdened by. The Maroon Tigers—20-4 overall and 14-3 in the Southern Intercollegiate Athletic Conference (SIAC)—are once again a No. 1 seed in the conference tournament, which began on Monday at the Bill Harris Arena in Birmingham, Alabama. Last season, the team became local media darlings after starting their campaign 17-0. They lost game 18 at Claflin University, finished their regular season 24-1, lost to Claflin again in the conference tournament semifinals, and then lost to South Florida College in the first round of the Division II NCAA tournament on their home court. But Morehouse is once again nationally ranked—21st in the country on the latest NABC Division II Coaches poll and ninth overall in the NCAA Division II Southeast poll. 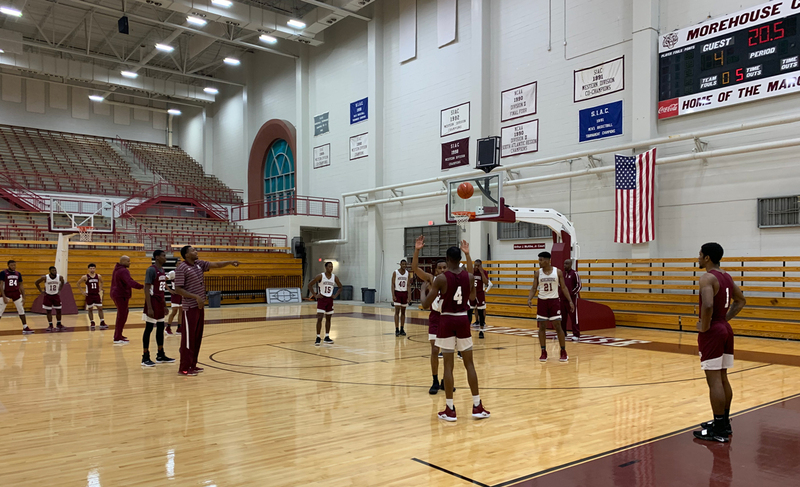 “We have been ranked the entire season, and we have the best record of any [college basketball] team in the state,” said longtime Morehouse head coach Grady Brewer, who added that his team is 45-7 in their last 52 games. The team has had a strong season by any reasonable measure but what Brewer—who for a consecutive year was named SIAC Coach of the Year—his staff, and the players themselves believe makes a good season is very different from general perception. Early on Saturday morning from his office inside Forbes Arena, Brewer tried to explain. Pulling out an old briefcase from under a couch against the wall, he produced a treasure trove of newspaper clippings on Morehouse basketball, some dating as far back as during his own Morehouse playing days in the late 1970s. This year’s roster is once again loaded with talent, including senior forward Omar Alston, the conference Player of the Year, averaging 14.5 points and 11.5 rebounds. The third option last season behind Tyrius Walker, the 2018 SIAC Player of the Year and current Westchester Knicks rookie guard, and current Director of Player Relations Martravious Little, Alston is relishing his responsibilities as the team’s strongest player. “My role is bigger this year, so I have to go out and try to do my best every night,” he said. As talented and versatile as Alston is—recently he had a triple-double of 15 points-12 rebounds-10 assists in a 85-70 victory over Benedict College on February 18, his second of the season—there’s more firepower down the lineup. Senior sharpshooter James Walker, junior point guard Michael Olmert, and sophomore guard Chibueze Ebinum each average more than nine points per game. Junior reserves Keith Heard and Tremmel Gooden, both from Atlanta, each chip in a little over four points per game and along with seniors Kendall Walker and Jairus Adley, junior power forward Kairo Whitfield, Bernard Cherestal, Colin Hadnot, and Devonte Butler, add experience and athleticism to a defense that is second in the conference in points allowed per game (65.0). Freshmen forward Xavier Brewer (coach Brewer’s son, who was a Division I prospect coming out of Sandy Springs High School); Olisa Akonobi, a 6-11 Nigerian transplant who has what Brewer calls “immense potential;” guard Chris Brown; and Malik Kennedy, a Toronto native, make up the future of the program. 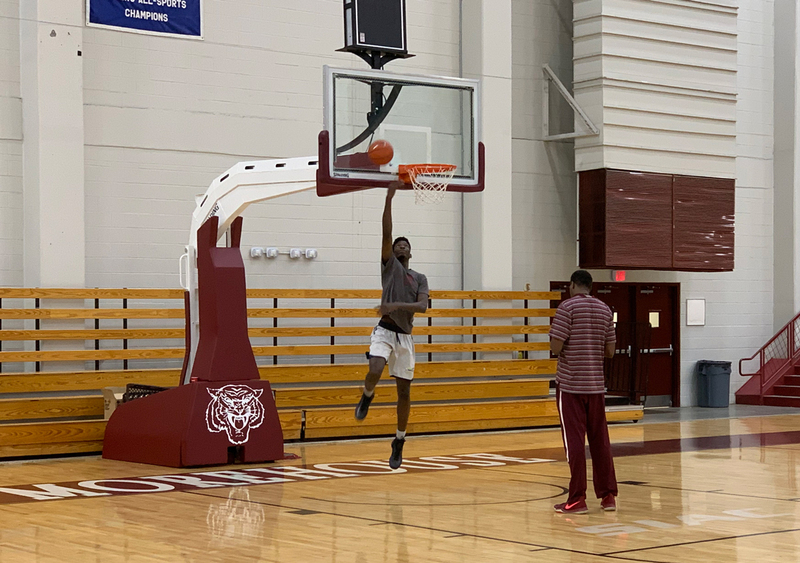 The Maroon Tigers have what is arguably their strongest team in years, but they still need to make a deep run in Birmingham this week and get into the NCAA Division II Tournament. “In the past we gave up multiple possessions and that hurt us,” said Whittler about last year’s SIAC tournament semifinal loss. “This year we have to finish by rebounding better, not making silly fouls and making our free throws.” Morehouse is currently last in the league in free throw percentage. 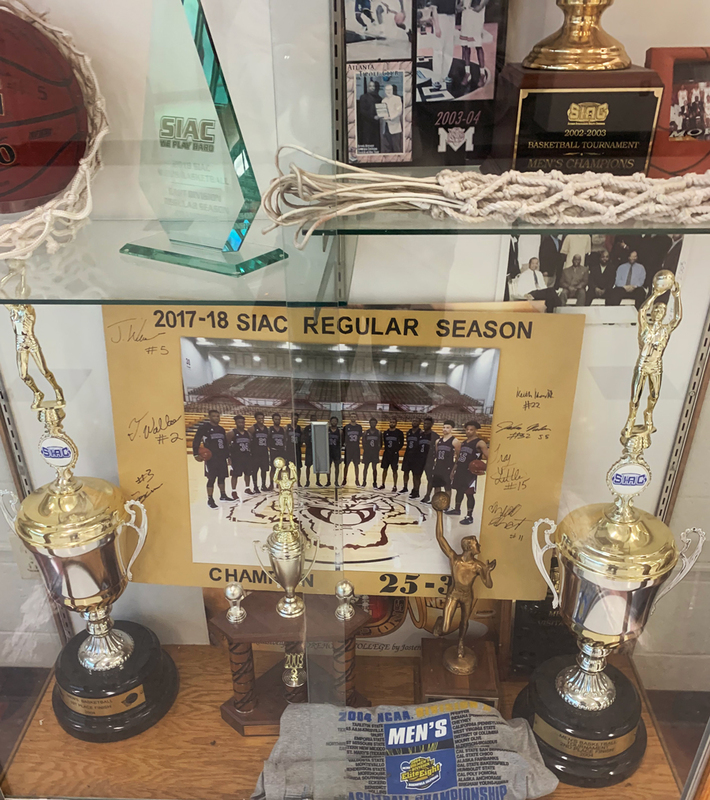 But one thing is for certain: when the Maroon Tigers open SIAC tournament play on Wednesday night against Paine College, they’ll have something to prove to themselves. “It has always been our goal to get on the national map,” said Brewer.